The first time I ate at Etch restaurant – we had some good friends visiting from Perth and we wanted to go somewhere memorable for our last lunch. Etch did not disappoint. It’s been years since that first lunch but when a restaurant leaves an impression on you, you remember what you ate -I had the sweet corn soup with blue swimmer crab and wagyu beef served two ways (a slow cooked braised beef and a grilled sirloin steak served with cafe de Paris butter) and their Caramel Date Tart. Since then we’ve been back many times and I’ve seen the menu change a number of times as Chef Justin North has a philosophy of using hand selected ingredients from local growers and producers. However, one thing that stays constant on their menu is their Caramel Date Tart. Now there have been many praises that have been sung about this signature dish and I am sure there are a number of people who would be glad to get their hands on this recipe. Through the kindness of Keiron Morrison and pastry chef Tiffany Jones at Etch – here’s the recipe that many of you have been waiting for! 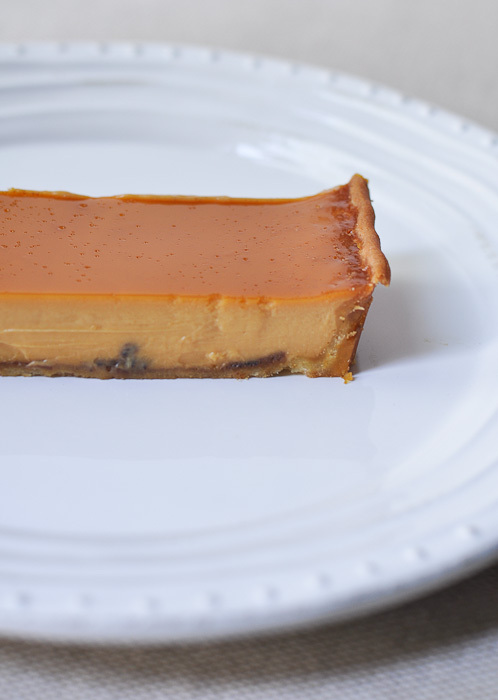 The caramel tart and sweet pastry recipe is adapted for home use from one of my must have cookbooks, Justin North’s , French Lessons. Thank you to everyone for sending through your Dare Me emails and comments. There are a few recipes that I’ve already gotten and will share in the coming days. If you’re looking for a recipe that you really love – then dare me to find it for you. Just drop me an email or a comment at the end of this post and I’ll turn your craving into a fun challenge and get you that coveted recipe! Heat the cream in a pot and set aside. Heat the sugar in a sauce pan to make a caramel. Once the sugar has reached a nice rich and dark colour, add the warm cream. Let the caramel/cream mixture cool then whisk in the eggs and egg yolks. Allow this mixture to cool and store in the refrigerator, around 1 to 2 hours. Meanwhile, roll the pastry out on a lightly floured surface to about 2 mm thick. Butter a 22cm x 2 cm tart tin (I used a rectangular tin) with a little melted butter and place on a baking tray. Roll the pastry up over the rolling pin and carefully lift it onto the tart ring. Press the pastry into the bottom and up the sides of the tim. Trim the excess pastry, leaving an overhang of about 1 to 2 cm. Patch any holes with the pastry trimmings. Prick the base all over with a fork and refrigerate for 1 to 2 hours. When ready to cook the tart, preheat the oven to 180c (fan forced). Line the tart with baking paper and baking beans and blind bake for 7 minutes. Remove the paper and beans and brush the inside of the tart with a little egg wash and bake for a further 4 minutes or until golden and crisp. Remove from the oven and sit on a wire rack for a few minutes to cool. Use a sharp knife to slice away the pastry overhang, leaving a nice even edge. Fill the tart base with the date filling (see below for recipe) and lower the oven temperature to 125c (fan forced). Pour the chilled caramel filling into the tart shell and bake for 30 to 40 minutes until just set, and still quite wobbly. Rest on a wire rack for at least 30 minutes before serving. Heat around 150 ml of water in a pan and place the tea bag of the Early Grey Tea. Allow this to infuse for around 20 to 30 minutes and then add the dates and bring this mixture to a boil for around 10 minutes. Remove the tea bag and mash up the dates with the back of a fork. Allow to cool before using for the tart. Put the butter and icing sugar in the bowl of your electric mixer and beat until lightly creamed. Add the salt and drizzle in the egg, a little at a time. Beating until it comes together as a smooth mass. Sift the flour and cornflour together briefly until it just comes together. Tip the dough out onto a lightly floured work surface and use your hands to shape it into a smooth flattened ball. Wrap in cling film and refrigerate for at least 45 minutes before rolling out. This pastry makes 500 grams so the excess can also be frozen for up to 2 months. I have never eaten this tart at Etch before but it looked so yummy I thought I would give this recipe a go. The tart came out really well, I personally prefer my desserts on the sweeter side however, it really was a well rounded dessert. The pastry was amazingly short, the dates had a lovely flavour and the custard was so smooth. 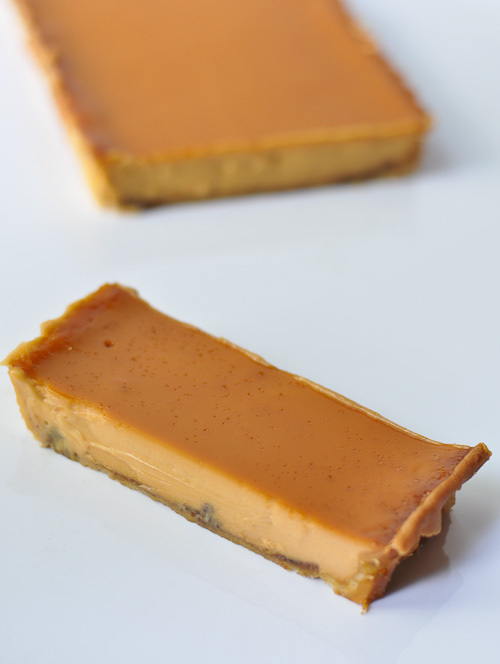 I went to Etch with a friend a few weeks ago and have been left with the memory of the deliciously tasting caramel date tart in my mouth since then. I’ve ventured to make this today and can see this being a big favourite for years to come. Hi Trissalicious, I just re-read the recipe…I realise the date filling oges first..thanks!!!! This looks great..I am making it right now…..question is when do you add the dates to the caramel filling? do I line the tart with the dates , then pour the caramel mixture or do I put the dates in the caramel mixture, then pour the combined mixture in the tart? If you can clarify – tht would be great! One of my cooks many years back used to serve us terriyaki eggplant. It was eggplant with the skin on cut into halves then cut into two inch lengths, cooked terriyaki style and topped with a bit of sesame seeds. they serve this at Sugi’s and I would like to teach my new cook, Andie who came from t. chito how to cook this but have’t found the recipe anywhere. I guess the cook brought it with her. Will you find me the recipe please???? wow, that’s lovely. i imagine the texture of it on the tongue would be enough to make a person’s knees buckle. Hmmm that looks great. I love this recipe. Yes – I want the black forest cake recipe!!!! That tart looks amazing. The recipe doesn’t seem all that hard either! Caramel and date sounds like a great combination. Thanks for sharing this fab recipe, Trissa! Thank you for sharing this! I want to make it for my next dinner party! The ates with the earl Grey combined with that silky, creamy filling sounds amazing! this is so deliciously goood… have a great weekend!!! This tart is absolutely divine! Can I use English breakfast tea for the date filling instead of Earl grey tea? I love the texture of this tart. Thanks for sharing! Oh Trissa…., you’ve done yourself proud my friend. This is one for the books, I’m lovin’ it. Trissa! I LOVE this a lot! You know, I think this would be totally fab for a Thanksgiving dinner, don’t you think? I’m sooo sure this is tastylicious! Yum! Reminds me of leche flan except this has a crust and a date filling. Divine recipe… that combination is perfect together.. dates and caramel… oh my! The color is so rich… what must it taste like??? No wonder it is a well kept secret at Etch. Marvellous looking tart Trissa. Must admit I haven’t eaten at Etch before, now I’m totally itching to go. Great series too. Beautiful, Trissa. Kind of like a flan with crust! It came out perfectly…smooth and creamy. Oh I have been waiting for this recipe. It looks incredible. It reminds me of Leche Flan. Delicious. I love that dare me idea! the tart’s looking like a killer to me! yum! Hi Trissa! I dare you to find a recipe for Pata Hamon. Those boneless pata slices served in cold cut platters in Chinese restaurants. I have searched high and low and I haven’t found one. Thanks. I do love your Dare section of your blog. 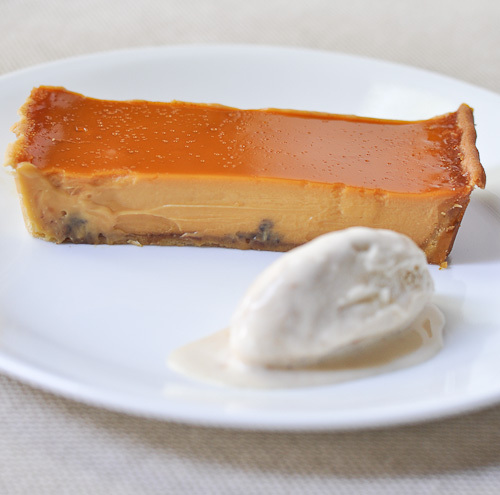 The tart looks delicious, date and caramel, you just can’t go wrong. Forget the fact it is Justin North’s recipe ;p I will be giving this one a go for sure. Well done! This looks amazing. I have to confess though, that my favourite part of the dessert is the slick of earl grey syrup down the middle of the plate. lol. Gosh… that is one deadly awesome TART! The date filling is brilliant. I WANT TO JUMP INTO MY SCREAM AND DEMOLISH THIS WHOLE TART! it looks like leche flan and I love leche flan!!! I always stuff up custards so mad props on making this tart that looks positively perfect! Oh, how I love how you started this series! This looks so delish. thanks for sharing the recipe. Damn, could’ve fooled me and said you took that photo from etch. totes loving your dare me challenge! etch’s tart is freaking awesome thanks for scoring the recipe for us! ARghhhh I have to make this, we enjoyed it so much when we went to Etch that we ordered a second slice! Seriously so good, looks lovely Trissa! Finally the recipe! I have heard so much about this gorgeous tart form you. I like how you manage to roll out such thin pastry and the filling looks silky smooth. Must try soon. wow, the filling looks extremely smooth and rich! What a great idea with the dare me…. recipes! I had not seen it before, but love the idea! And this caramel date tart, well, what is not to love? It looks delicious! Have you made this yourself, Trissa, to see if the recipe is similar to the one you ate? It looks deadly! I love the Dare Me Challenge. I have missed the onset of it… hmmm… but – here is one for you! can you get Heston Blumenthal to give you his black forest cake recipe from The Fat Duck? Actually, it is probably in his cookbook. I should check. I couldn’t make it like he does anyhow. I have to ask for something more attainable (by me)… hmmm, I will think about it, and definitely get back to you. Hey Val – the recipe is exactly like how I remembered it. Yes I made it myself! 🙂 I know I can get a copy of the Black Forest Cake – I believe it is in one of the books I have. Let me know if you want it! Oh – this sounds incredible! I’m so happy that you’re getting requests, and also that you’re able to find the recipes! It looks absolutely lovely. I love this idea of recreating stuff from the restaurants you go to :). I do it too, with varying degrees of success LOL. Dare you! Lady, when you turn such awesomeness, I don’t dare to dare you at all!!! That tart!!!! can I have a slice please?? Or better yet, can you make me a WHOLE tart????? Bonjour, félicitations! Une merveilleuse recette, d’un ventilateur très délicieux de son br! So cool to see this idea has taken off, and this is a great recipe to start it 🙂 Love anything with dates and this filling looks sooo very smooth. Fantastic challenges you’ve set yourself here m’dear, would be interesting to see what else you have up your sleves. Thanks for sharing these recipes with us!